For LEGO fans in and around Hong Kong Brick Adventure 2011 is coming very soon to City University. See below for the press release and thanks to John Ho (IcedPlusCoffee) for sending it to me. LEGO have been bringing people in the city up with fun and creativity in constructing their own characters, houses, castles, and even city. Bricks Adventure is a city-wide bricks showcase of the year, presented by the War & Adventure Games Society of City University of Hong Kong (CityU), jointly organized by Legend Bricks. Bricks Adventure now comes to its second annual exhibition and will bring you to a miniature of virtual and reality world, showing the varieties of bricks and great imagination of creators. The main theme of this year Bricks Adventure is “CITY”, different Japanese-style architecture will all come into view. Beside, theme such as “PIRATE” is the first show in the Hong Kong. All minifigures of pirates are in proportion. We think, we build and we share. Bricks Adventure is sharing thoughts and ideas while exchanging more of them through tours and other interactions. Educational and group tours guided by creators of Bricks Adventure 2011 will give you a glance of LEGO creation. Reservation needs to be made on a first-come-first-serve basis. Groups from kindergartens, primary and secondary schools, institutions, organizations are all welcomed to register for guided tours. 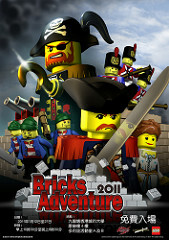 Bricks Adventure 2011 and guided tours are free to all. We look forward to seeing you in Bricks Adventure 2011. For more details, please visit Bricks Adventure 2011 official website, Flickr Page or Facebook Page. Over 30 Participants to join the Exihibition. More than 11,000 people visited our show, Thanks all !